Please take a moment to send an e-mail to your legislator to support the new bee lab in the state bonding bill. It only takes a few minutes. The bee lab is desperately needed to help solve the problems the honeybees are facing today. The adage the squeaky wheel get the grease is the truth. 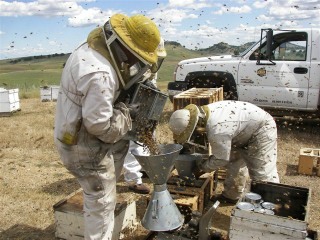 Many of the beekeepers that read this blog are from all across the state. Reaching out to all the lawmakers around the state will definitely put this issue on the front burner. Watch the blog for any new updates. Check the blog before coming to pick up to make sure the bees have arrived. This is the pick up schedule for the SECOND delivery. Please try to follow the pick up schedule so the pick up goes smoothly. Beekeepers over 100 miles away come when you have to. I would appreciate cages returned by this weekend so I can send them back to California when the next load of bees come in. The second delivery of bees is scheduled for May 1st. Check this blog daily when we get near May 1st for updates. The date can sometimes change. 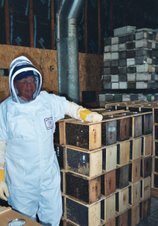 About 7 - 10 days after hiving a package a beekeeper has to go into the hive and look for eggs. Eggs signify queen acceptance. Plus the laying pattern should be solid with not missing many cells. 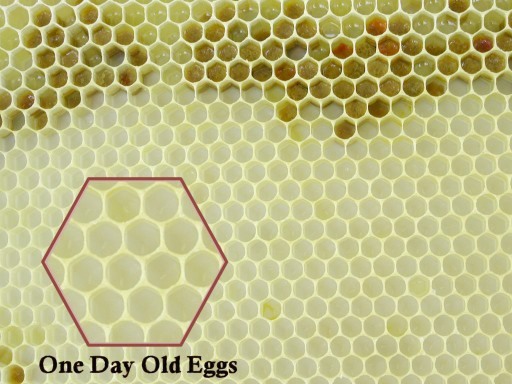 Sometimes when a queen starts laying, it is not uncommon for a queen to drop two eggs in a cell. This is normal. Within a week this behavior stops and she will get down to business. Not many eggs can mean a poor queen and she should be replaced. Sometimes a queen takes up to fourteen days to start laying. The bees are unloaded and we are ready for beekeepers. Please stay with your car and move forward as the line progresses . We will come to the car. 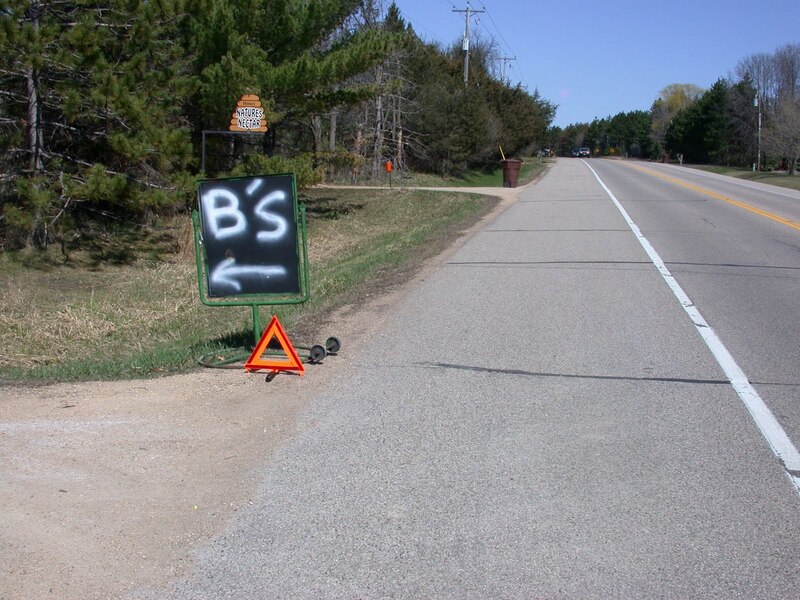 Please turn into the driveway marked with the Bs sign. Please do not come early. Please check this blog before you come to make sure that nothing has changed. I will also be here Monday 8 am - 6 pm for bee pick up. Check this blog to make sure the bees are here before coming to pick up. Turn in to this driveway marked by this sign. Stay with your car we will come to you. Cages: please clean out all cages of all debris. Throw out the can and queen cage. Cages with ripped screens or broken boxes will not be accepted. Prices for supplies being sold. ProSweet bee feed .. $43.00 per 5 gallon pail. Hive the package at around 6 pm. If you are hiving on drawn comb no problem. If you have some honey scratch open a couple frames when you dump the bees in. Warm up the honey two days before the bees arrive. No honey, fill a couple drawn frames with warm sugar water using a sprayer. If you use the marshmallow queen release. 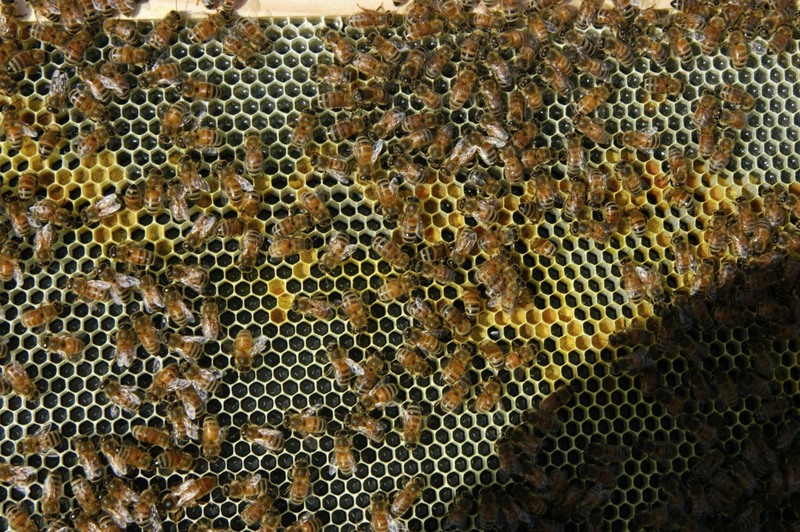 Make sure the queen cage is covered with bees before squeezing it between the frames. Hiving on foundation. Best to bring the bees into the basement set them on a piece of cardboard. Feed them with a sugar water sprayer by spraying the screen. Don't soak the bees. Get the screen wet, walk away, ten minutes later do it again. Maybe three or four times. Do this when you get the bees home and before bed. The next morning do it again and then again about an hour before hiving the package. This gives the bees a full stomach before they get dumped into the hive. At around 6 pm pull out four or five frames from the hive. Put the whole cage in the hive and put the covers on. The bees will warm up the hive. After the hive is warmed up installing is the next step. Pretty much the same as my video. Make sure the sugar water is warm. If it is cold you might not have to spray the bees at all. Just dump them in. The queen needs to be kept warm during this whole process. use the same method as above. Take the sugar sprayer and spray the sheets of foundation with syrup keeping the frame straight and level. Ritecell foundation has a deep impression of a cell. This will hold sugar water so the cluster has food to eat right away. Usre the frames the bees have warmed up. 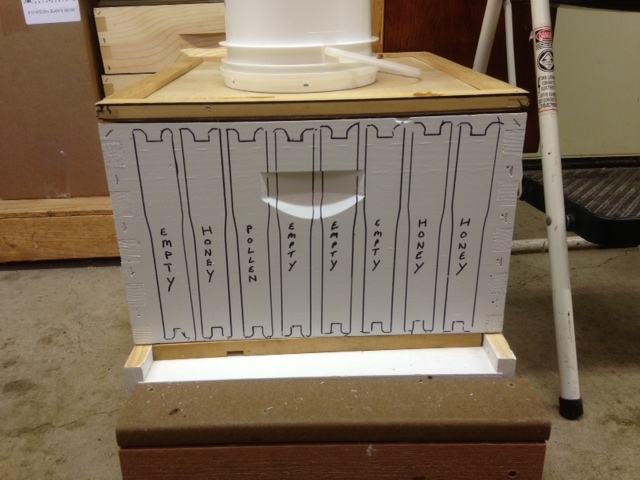 Put the warmed up frames on top of the bees and bring the cold frames on the outside of the hive body. 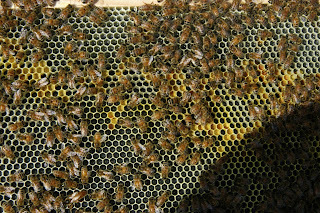 After the queen is installed, lay on the pollen patty and close up the hive. The next morning come back and lift up the feeder pail. If there is a large mass of bees under the feeder pail you are home free. If there are few bees under the feeder, they may have moved off to one side. Light a smoker and open the hive removing the lids. A puff of smoke on the bees. If the are not under the feeder, remove frames opposite the cluster, there should be no bees on these. Then gently slide the frames the bees are on to the center under the pail feeder. Put the other frames back into the new open space in the hive. Close up the hive. 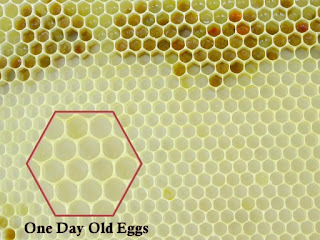 Look for eggs after 7 - 10 days to see if the queen is accepted. The new pickup date is Sunday the 21st. Check this blog every day because the date can still change. Check the blog before coming to pick up to make sure the bees have arrived. This is the pick up schedule for the first delivery. The schedule may be modified to fit with the arrival time of the bees. Please try to follow the schedule so the pick up goes smoothly. The package bees were shaken today in Chico, California for the trip to Stillwater. The truck will leave Friday afternoon and with good weather will be here Sunday, in the morning. We are hoping for safe travels and good weather. Upon arrival, I took the Queen out of her cage to look at her. She stung me and flew away. I was busy and did not install my bees the day they arrived. I didn’t want them in the house overnight, so I put them in my bass boat outside for the night. The next morning they were all dead, as the temperature fell below freezing. I put both of my packages into my one hive and turned both Queens loose at the same time. I was not home when my bees arrived. my wife put them in a sealed plastic bag as she was afraid of them. They were mostly dead by the time I got home. The spray container I used to spray some sugar water on the bees had been used for spraying insecticides before. This killed my bees...I did not know they were that sensitive to insect poisons. Check this blog daily for any delivery updates. This is the pick up schedule for the first delivery. Please try to follow the schedule so the pick up goes smoothly. Beekeepers over 100 miles away come when you have to. This picture shows 8 frames because the layout of the frames for coloring them on the box would have been too tight and looked funky. I use 9 frames in my boxes. The 9th frame could be empty or honey, beekeepers discretion. This is how I set up a hive for package bees when I am replacing a dead out. The pics show the frame arrangement I put in the box. That is considering the bees will be put in the center. If you have three frames of honey in the box you do not have to feed sugar water. No honey? A spray bottle with 1:1 sugar syrup can be used to spray syrup into the drawn comb of a frame. It takes a bit of effort but a frame can get quite heavy from the syrup. 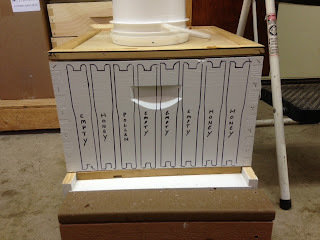 The syrup frame can be placed in the center of the hive under the feeder pail. They bees will cover that frame and produce heat. 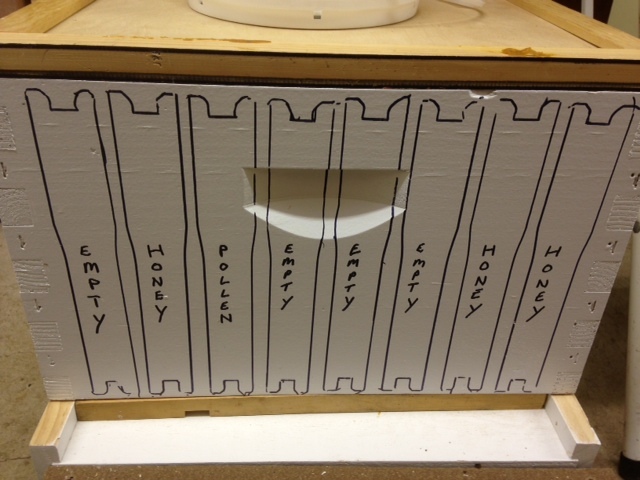 The box lists the frames and the position I use for when the bees are dumped into the hive. I will take a capping scratcher and scratch open the two frames of honey next to the bees. So the bees will have food available when they are put into the box. The honey will give them the ability to create heat to warm the hive. Even if it is cool out the bees will be fine. It is a good idea to bring the frames of honey indoors for a few days before the bees come so they are not eating cold honey. When it is cold out pail feeders work the best for feeding a colony. Hive top feeders can be a struggle for the bees to get to if they are in a tight cluster and there is a possibility that they could starve if it is cold out. Entrance feeders are not meant for spring feeding in Minnesota. Bees will starve and die because they cluster under the inner cover and can't break cluster to get to the entrance feeder. 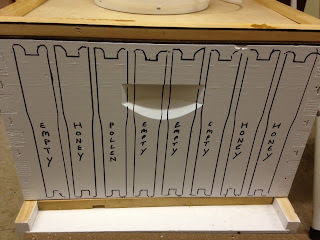 Use 9 frames in the box with the ninth being honey or empty. When the bees come in, the bee supply store will be closed April 19th and 20th. The only thing for sale will be pollen patties, feeder pails, ProSweet syrup and Fumigillan. Keep watching for updates. The delivery dates can always change.